This video provides a summary of the career of the American photographer Alfred Stieglitz. The music is Pauline García Viardot’s “Hai luli” sung by Cecilia Bartoli. Alfred Stieglitz (1864 – 1946) was an American photographer and modern art promoter who was instrumental over his fifty-year career in making photography an accepted art form. 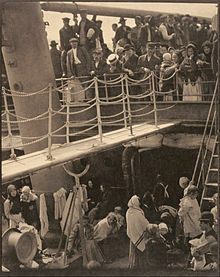 In addition to his photography, Stieglitz is known for his photography magazines; for the New York art galleries that he ran in the early part of the 20th century where he introduced many avant-garde European artists to an American audience; and for his long passionate romance with his muse, the painter Georgia O’Keeffe. This entry was posted on June 14, 2015 by Vox Populi in Art and Cinema, Music, Opinion Leaders and tagged 221 Gallery, Alfred Steiglitz, American modern art, American photography, Camera Work, Georgia O'Keeffe.